When it comes to conservation projects or wildlife care institutions, then exactly what these projects and organization do achieve is the most important measure of their worth (and ethics). But for many organizations, there is an absence of details regarding the quantifiable outcomes of their institutions and projects. Regarding conservation volunteering: In 2012 Peter Lynch commented that “there are numerous cowboy outfits in the marketplace that are quite happy to milk money from volunteers, and the fields are full of stories about counting the same turtles that were counted by a previous group, painting a school that was painted a month earlier or collecting worthless data that sits unused” [LP12]. Peter Lynch was right then, and it is still the same today. We have witnessed a few of these projects ourselves and sadly we have to report that such projects are flourishing. Although at the same time, there is a little community of genuine conservationists, conservation-minded travelers, and volunteers that is growing as well and work hard at raising awareness about it. Zoos and sanctuaries have their own specific and often local accreditation schemes, to which only a minority of zoos comply to (contrary to what the public wants to believe). But as far as volunteering is concerned: no, there are no established accreditation schemes listing responsible organizations. Volunteering is still a completely unregulated business. These days, the default way of searching is to google it. So in order to filter down to a manageable list of results, here are a few recommendations. 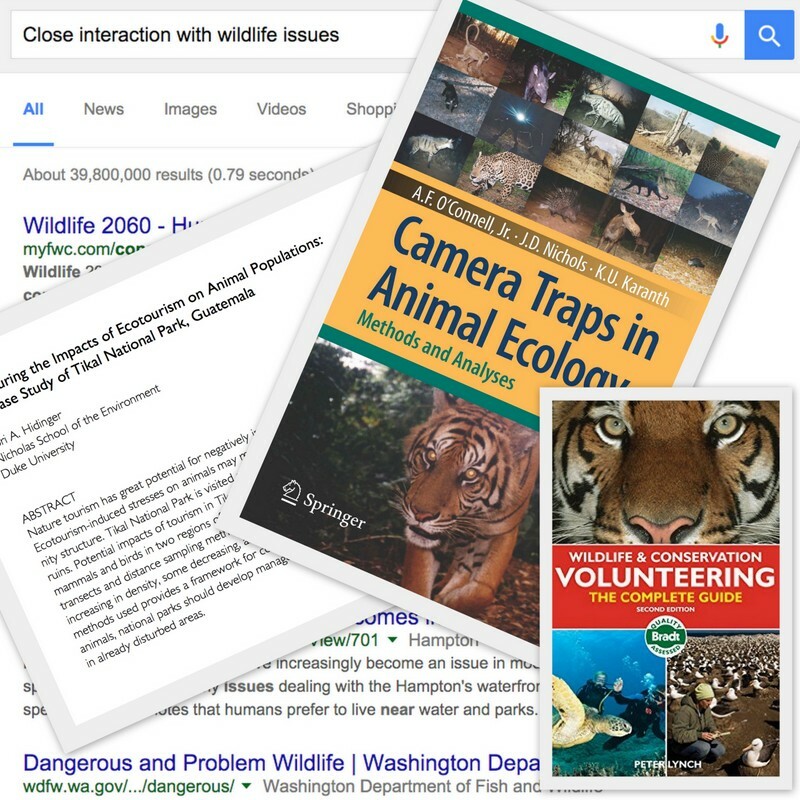 An easy way to start the search is to break it down with your priority criteria: that animal, that ecosystem, that country that you want to learn about and volunteer with/for. Add to your search criteria terms such as ‘ethical’, ‘responsible’. It won’t filter out all questionable institutions, but it will/might raise warnings and some of these warnings should not be discarded [GS16]. Also, do not necessarily rely on user reviews from travel websites, which generally focus on the entertainment dimension more than on the ethical aspect of a venue. Try adding ‘reviews’, ‘scandals’, ‘unethical’ to search terms as well to come at it from the opposite angle. When it comes to animals then you can refine your search using keywords such as ‘sanctuaries’, ‘rescue center’, ‘field conservation’. Beware that many institutions that allow selfie photo opportunities next to, with or on an animal, or that generally emphasize a hands-on placement with opportunities to handle primates, big predators and other animals (like pets), should ring alarm bells in your head and are highly likely to be questionable, even unethical. For instance, more than 90% of lion cub petting facilities in some African country were found to be tied to the criminal activity of canned hunting, the same level of criminality goes with organizations that allow close contact with tigers or other big predators. Another infamous example is the Thai Tiger Temple that was found to be tied to the wildlife trafficking of tiger parts [GS16]. The Global Federation of Animal Sanctuaries [GFAS] provides some useful tips on how to spot shady sanctuaries and captivity institutions. Also, check our References & Further Reading section for more help. When working with organizations, then organizations such as Ecoteer and travel agencies such as Responsible Travel, that are growing, can connect you directly with some charities and enterprises. Longer-lived citizen science driven organizations (e.g., Earthwatch, Biosphere Expeditions), for which a portion of the mission fees go to funding the science, are also good organizations to investigate. Again working with middle-men organizations should not exempt you from checking that a listed project is ethical and responsible – e.g., many placement companies for instance still propose to volunteers caring for lion cubs under the conservation banner when it is indisputable that the large majority of these facilities are known to fuel the trophy hunting industry and/or the illegal wildlife trade ([SS15], [BL15], [GS16]).